Ashburton Grove - Arsenal news and Arsenal opinion: Fabregas & Wenger crunch talks expected - Clichy sold Nasri next? Fabregas & Wenger crunch talks expected - Clichy sold Nasri next? So we say farewell to Gael Clichy after eight years of service to Arsenal Football Club as the defender leaves us for pastures new after the club accepted a £7m bid from Manchester City. 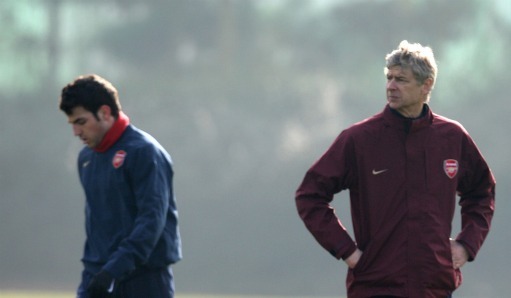 "I have had eight fantastic years at Arsenal and made many friends. I have so many great memories from my time at Highbury and Emirates Stadium. "I would like to say thank you to everyone at Arsenal for all of their support and friendship. I also want to send a big thank you to all the Arsenal supporters, who have always been so good to me." "We would like to thank Gael for eight years of terrific service to Arsenal, during which time he gave absolutely everything for the Club. He has grown and developed so much since joining us in 2003, and has been a crucial part of the team over recent seasons. "Gael leaves with our respect and best wishes. We wish him the very best for his future career." Personally I think it's the right time for both parties to move in opposite direction. I can imagine that Gael had got itchy feet. He'd not won anything at the club since becoming first choice left back and probably needed a new challenge. Whilst we have got several young players coming through in his position. I would have liked him to have stayed if I'm honest. I think he had the hardest role within the team. From where I sit in the north bank, Clichy would be the player who was always nearest to me. And you could often see how exposed he got with other players not tracking back and shirking their defensive duties. Yes, he was responsible for a numbers of errors but for me the positives out weighed the negatives. After 264 appearances in all competitions and a single goal to his name in an Arsenal shirt (against Stoke in November 2008) Clichy joins Arsenal old boy Kolo Toure in the north west. Gael's always come across as a genuinely nice guy and I wish him well. There are no hard feelings. Clichy's departure creates a huge opportunity for Kieran Gibbs. He's not been able to force himself into the team when Clichy was there so Arsene Wenger has made space for him to make the position his own. I think Gibbs will be our first choice left back this season but it will be interesting to see who the manager will use when or if the Englishman gets injured. Armand Traore is back from his season long loan in Italy. He could do that job but has failed to impress so far in his Arsenal career when exposed defensively. Interesting times ahead. Several members of the first team squad were back at London Colney yesterday for fitness tests as pre-season training officially gets underway today. One of the faces to have been spotted was captain Cesc Fabregas who underwent fitness tests, despite reports in the Spanish media that he'd refused to return to London. Cesc has too much respect for the club to have not turned up when he was expected to do so. It's going to be an interesting week to see how his future at the club plays out. The Daily Mirror say he's due to sit down with Arsene Wenger to discuss his future today. Interestingly the Mirror believe that Cesc is still injured and won't make the flight to Asia on Sunday even if he still is an Arsenal player. Personally I think we're coming to a point where Barcelona need to stump up the cash for Fabregas or we move on like we did last summer. It appears they aren't prepared to meet our valuation of Europe's best midfielder, so it should be coming to a point where they have to admit defeat. We can get on with our preparations for the new season and start making some signings of our own. And with Clichy already through the exit door to Manchester City, could they be back with an audacious bid for Samir Nasri? Say for £25m... If the attacker cannot be persuaded to sign a new contract with the club - and I think we're getting to a stage where it's becoming more and more likely he won't - we have to think about finding a buyer. If Arsene Wenger can work his powers of persuasion on the player and he agrees to sign all well and good, but I think he's already had his head turned by other offers. I think his future will also be sorted out by the end of the week. A couple of bit of other news. Owen Coyle has said he wants Gary Cahill's future sorted and would like to see someone take him off his hands sooner rather than later. Denilson has been linked with an move to Villarreal. Alex Song might be in trouble with the law. And Saint-Etienne have put a £13.3million tag on midfielder Blaise Matuidi who we've been linked with already this summer.